this winter has been an odd one. temperatures and precipitation have been all over the place. all of the back-and-forth with the weather leaves our skin aggravated. three winters ago, i shared my top 5 winter skin care must-have products. we still use and love all of those, but since then we have added a few more to our routine which have become favorites too. here's what we are currently giving two thumbs up . . .
1. everyone 3-in-1 soap in citrus mint - ryan came across this in the grocery store and we decided to give it a try based on the way the bottle read and the fact that the smell was great. this soap is a shampoo, body wash, and bubble bath, but we just use it as a shampoo. every time we use it we feel like we are at a spa. the smell is amazing, it has a nice tingle, and it cleans our hair without leaving any residue behind like other shampoos. 2. yes to paper face masks in cucumber calming - i first found these face masks a few months ago in ulta beauty and decided to give them a try. ryan and i both fell in love with them. the first one we used was the cucumber calming and it was the perfect way to give our dry skin a moisturizing boost in the winter. it was like having an inexpensive 10 minute facial at home in our pjs! since then, we've tried other scents too. 3. tom's of main deodorant in north woods - in an effort to stay as natural as possible, ryan gave tom's deodorant a try. he was surprised how much he liked it and how great it smelled (like lavender)! i tried it too and fell in love with the smell. 4. the post lip butter in peppermint - my mom first discovered this lip balm which is made by a local company in our area. she liked it and bought it for us for christmas this year. we have been absolutely loving it and it's ingredients! 5. aveeno daily moisturizing body wash - in an effort to change up our body wash routine, we tried this body wash to help moisturize our dry winter skin. it works great and the smell is so nice and mild. 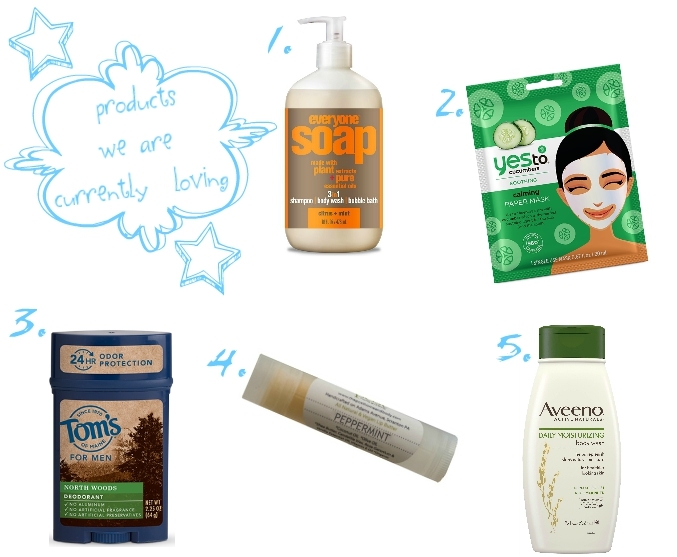 *please note: this is not a sponsored post, these are products we have used and loved. I will have to give some of these products a try. I have tried the Bee Soap and it makes my skin feel so soft. I got it as a sample and would like to buy more. I would like to try the Everyone Soap; maybe you can tell me where you found it. I have been using the Tom's lavender deodorant for years and like it because it does not contain harmful ingredients.